WTI crude oil continues to trend higher inside an ascending channel and has just reached the top. Resistance is still holding so a pullback to support or the nearby Fibonacci retracement levels might be due. The 50% level is close to the bottom of the channel and area of interest that might be enough to keep losses in check. This is also close to the 200 SMA dynamic inflection point that might be the line in the sand for any corrections. A break below the $56 per barrel level could be enough to signal that a selloff is due. The 100 SMA is still above the longer-term 200 SMA, though, so the path of least resistance is to the upside. In other words, the uptrend is more likely to gain traction than to reverse. In addition, the 100 SMA lines up with the mid-channel area of interest to add to its strength as support near the 38.2% Fib. A bounce could take crude oil back to the swing high at $60.48 per barrel or the top of the channel. 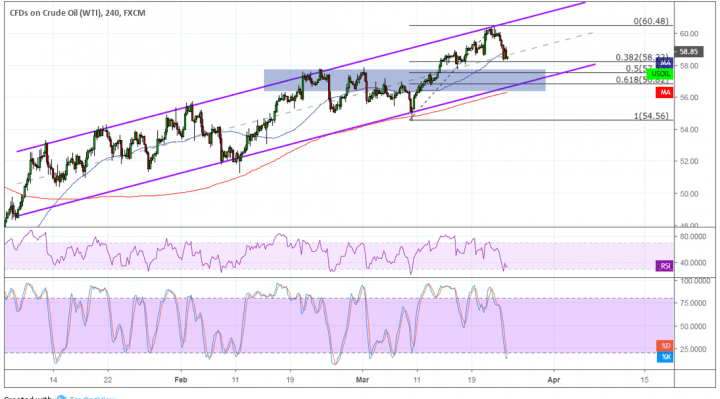 RSI is already indicating oversold conditions or exhaustion among sellers. Turning back up could confirm that buyers are ready to return and continue the climb. Stochastic is still pointing down, so there may be some selling pressure left to keep the retracement going. This oscillator is also closing in on the oversold region, though. Crude oil drew a lot of support from falling supply levels globally and in the US. However, risk aversion swept over the markets before the end of the week on account of global growth concerns. For one, the Fed sounded more cautious in its statement as it hinted that it probably won’t tighten at all this year. Euro zone leading indicators also showed that the slowdown in the region is far from over.